Question: Recently my refrigerator freezer ice maker stopped making ice cubes after a long power outage. It is the type of ice maker inside the freezer that just drops the cubes into a bin. I can hear it cycle but there are no ice cubes being produced. Everything else on the refrigerator is working properly. Is there something I can check or inspect before calling a repair person? I need to save money so anything I can do myself to fix the problem would be helpful! Answer: FIRST and foremost… There is usually an arm that moves up and down to turn the ice maker on and off. Make sure it is in the down position to make ice. If it is then there may be an on/off switch located on the ice maker itself. Make sure it is not off. If the ice maker is on, then the issue is most likely caused by a frozen chunk of ice in the water line. There are components in your freezer/fridge that should prevent this from happening, but sometimes after a power outage, this can happen. If you suspect this is what has happened to your ice maker, unplug the fridge from power, slide it out from the wall, and turn off the water supply on the wall. The frozen chunk of ice most likely will be in the water line inside the freezer. At this point you can remove the ice maker from inside the freezer so you can inspect it. It is usually held in place by a few Phillips screws. It will also be connected to a wire harness that needs to be unplugged before removal so use caution. Remove the ice maker and inspect it for any type of jam caused by a piece of ice that may have refroze after the power came back on. Is there anything blocking it from functioning normally? If so, remove the ice blockage and set the ice maker aside. Now, look in the freezer and find where the water comes in to feed your ice maker. Inspect the tip of the water line to see if there is a small chunk of ice blocking it. If so use a pointy object and remove it from the line. If you have found no ice blocking the water line, further troubleshooting is needed. Another issue could be that your freezer is not getting to the proper temperature to let your ice maker produce ice. The inside of the freezer should be below 10 degrees F for the ice maker to function properly. If it has been only a short while since you have restored power, give the freezer at least 24 hours to get cold enough. It can also take around 48 hours to actually fill the ice bin. You can check the freezer temperature dial that should be located near the top of the inside of the refrigerator. Lastly, when the power kicked back on, there may have been a voltage spike. A voltage spike may have burned up a component in the freezer or ice maker. If this is the case, it may be best to call a repairman unless you have expert knowledge of how a refrigerator/freezer works. Knowing how to use a multimeter will help also. Whenever working with electricity, use extreme caution as injury can occur. 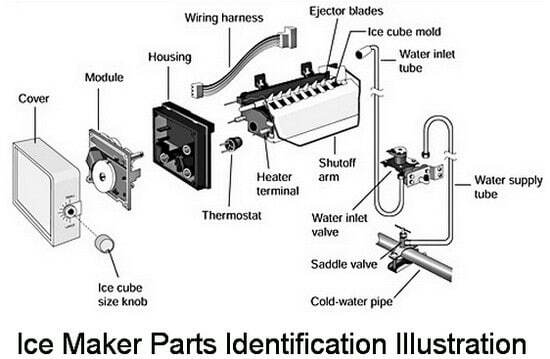 If you are having other ice maker problems, check here to find other ice maker troubleshooting methods.